Former England captain Rio Ferdinand on BT Sport:"Cristiano Ronaldo is a living football God and it is ridiculous what he is doing. "In the Champions League he has got every record you can imagine. It was also against an Atletico team that is renowned for having a great defence." Ronaldo has scored eight Champions League hat-tricks, the joint-most in the competition alongside Lionel Messi. The Portuguse has been directly involved in 77 goals in 77 Champions League knockout appearances (63 goals, 14 assists). He has scored 124 goals in the Champions League, more than Atletico Madrid have netted in the competition (118). He has 25 goals in 33 career appearances against Atletico Madrid. Another memorable night of Champions League action. Manchester City hammered a team that were absolutely average. Schalke were naive and self destructive, but we saw some nice things today from City - they only had 15 shots on target and scored seven of them. City don't learn a great deal but it was a dream scenario for them with all the games they have to play. They scored and cruised. City's players moved the ball so well. 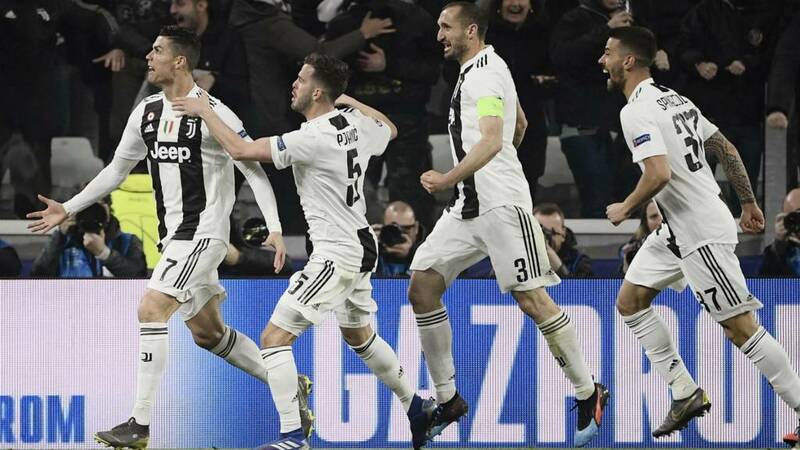 Juventus hat-trick hero Cristiano Ronaldo: “It was always going to be a special night and it was, not only for the goals, but for the team. This is the mentality of champions, this is the journey to follow, we enjoyed a magical night. "Atletico were a difficult team, but we were strong too. We will see what will happen." Juve defender Leonardo Bonucci: “It’s a great night for the Juventus family, and we responded on the field. In the first leg, we were missing something, but today, we gave everything, and Allianz Stadium was our 12th man in an incredible night. Atletico Madrid captain Diego Godin: "We weren't able to find ways to attack them. They were able to score and we couldn't score the goal that we needed to qualify. We will continue giving it our all until the end of the season." Striker Antoine Griezmann: "They were the better team today. It wasn't our day." DigitalTeez: Yeah I got that one wrong (see 20:08). Nathan Stokey Dray: Where can City improve? They are just the greatest team at the moment. Greg Morter: Manchester City took Schalke to the cleaners who were bamboozled. VAR is a joke imo. Manchester City’s progression means there will be at least three English teams in the quarter final stage of a single Champions League campaign for the first time since 2010-11 (Chelsea, Manchester United and Spurs). Liverpool can make it four if they get past Bayern Munich on Wednesday. Only two places left up for grabs for Friday's quarter-final draw. Former England captain Rio Ferdinand on BT Sport: "Cristiano Ronaldo is a living football God and it is ridiculous what he is doing. Manchester City manager Pep Guardiola speaking to BT Sport: "It was a clear result. We are happy to get to the quarter-finals. We didn't start that well, we were a bit scared to play. But after it went 1-0, we relaxed and decided to play and be aggressive. "Of course with the qualification already secured, it was tough for them and we kept a good level. We have a lot of injured players so we want to continue this run and get those players back fit. "Everyone has to compete with each other to play. They all want to play. Everybody tried to play, be bold and keep going. On the use of VAR: "They need to be a little bit quicker to make decisions but it is fair. The two penalties went against us from VAR in Germany but at the end it is fair. At the end that is what we are looking for. Hopefully in the Premier League next season that is what can happen. I am happy with VAR. Hopefully it can be quicker than today. Seth Gogo Egoeh: Cristiano is simply the best! What a man! Turned up when he's needed most! I hope the haters who were doubting him have buried their heads in shame! Perfect response to silence the critics! Lotak: You play negatively, you get what you deserve. A Madrid were completely destroyed and Juve fully deserved to go through. Juve and City scary good today. Remember this after the first leg...? Atletico Madrid manager Diego Simeone has apologised for any offence caused by his celebrations against Juventus, but said: "I did it from the heart." Simeone turned towards fans and grabbed his crotch after Jose Maria Gimenez opened the scoring in a 2-0 win. "It's not a nice gesture, I admit, but I felt the need to do it," he said. "I did it as a player at Lazio and I did it again to show our fans that we have cojones. I can only apologise if anyone was offended." Just looking at replays of full-time in this game and Cristiano Ronaldo celebratedby doing the same. Manchester City winger Leroy Sane speaking to BT Sport: "It was a good game again from us. We knew it would be tough but we did really well and we're happy. "They stood firm and compact at the start but we know what to do to find the spaces. It was a good win. 18-year-old Phil Foden: "Every time I come on I just try to enjoy my football. I try to concentrate and improve. I enjoy scoring goals. "You are learning all the time in the changing rooms, on the touchline and when you come on. I am learning every day. I will try to keep improving each day. "They are all great lads and great players so it is just a pleasure to be here." Leroy Sane (1 goal, 3 assists) became the first player to have been involved in four Manchester City goals in a single Champions League match. The Schalke fans who have travelled around 500 miles to get to Manchester for this tie did not exactly thank their team for their efforts when they trudged over to see them at the final whistle. There seemed to be a lot of angry gestures being made, but fair play to the players for fronting up.